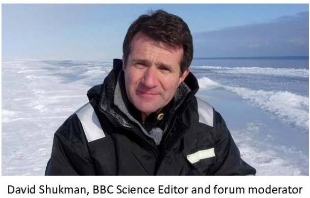 Promote the need for a sustainable ecosystem-based management of the Arctic Ocean. Moderated by David Shukman, BBC Science Editor, the forum programme included David Vaughan (British Antarctic Survey), Paul Connolly (President of the International Council for Exploration of the Sea), Antje Boetius (Alfred Wegener Institute for Marine and Polar Research), Stein Sandven (European Space Agency), Kári Fannar Lárusson (Arctic Council), Carlo Barbante (Italian National Research Council), Paul Wassmann (Univ. of Tromsoe), Robert Blaauw (Shell Den Haag & International Association of Oil and Gas Producers), Paul Berkman (University of California) and Kurt Vandenberghe (European Commission DG Research & Innnovation). The event concluded with a high-level panel discussion with participation from science, industry and policy. The 4th EMB Forum was co-organized by the EMB and the European Polar Board and was an official ICARP III event. The organizers greatefully acknowledge the support of the UK National Oceanography Centre (NOC) towards the runnings costs of the forum, and of the Royal Flemish Academy of Belgium for Sciences and the Arts (KVAB) for the logistics support. 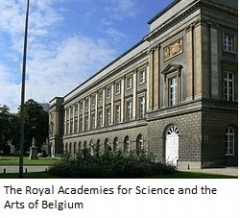 The Forum took place in the centre of Brussels, at the Royal Flemish Academy of Belgium for Sciences and the Arts (KVAB, Hertogsstraat 1, 1000 Brussels), on Wednesday 12 March 2014. The Academy is situated to the left from the Royal Palace, across Hertogsstraat.